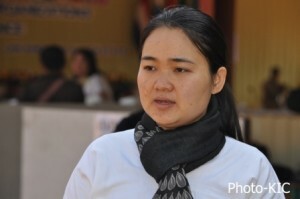 In an exclusive interview with Karen News, the Secretary of the Karen Women’s Organization (KWO), a community based organisation representing more than 49,000 women including refugees in Thailand and internally displaced persons inside Burma, said that ethnic women were second-class citizens in their own country. “We are not only ignored, we are being abused and victimized. The peace talks don’t include a significant or meaningful level of women participants on the Burmese side or the ethnic side. We have helped hold our community together over the many years of fighting. We are leaders in the struggle for justice for the Karen people. It is time we had a seat at the table for peace,” the secretary of the KWO, Naw K’nyaw Paw, said. The KWO joins a growing group of human rights organisations and ethnic political parties calling for an international investigation into acts of sexual violence perpetrated by the Burma Army. The Kachin National Organisation said it had documented cases of sexual violence as recently as April 10, when a 17 year-old schoolgirl in Kachin State was allegedly gang-raped by soldiers from Light Infantry Battalion 320. Naw K’nyaw Paw alleged that responsibility for military perpetrated sexual abuse went to the top levels of command. Burma’s constitution, which guarantees a quarter of seats in parliament to the military and cannot be changed unless 75% of the parliament votes in favor – thereby making it all but impossible to reform without military approval – also prevents Aung San Suu Kyi from becoming President. Naw K’nyaw Paw said it was a fundamental barrier to achieving justice for military perpetrated abuses. A January 2014 report by the Women’s League of Burma, a multi-ethnic umbrella group representing 13 Burma women’s organisations, concluded that sexual violence was a wartime strategy employed by the Burma Army. The report documented more than 100 cases of military perpetrated sexual violence since 2010 with victims as young as eight – Of the cases identified, 47 were gang rapes with 28 women either killed or later dying of their injuries. This entry was posted in Organizing and Information Gathering, Uncategorized, Violence Against Women and Safe Houses and tagged Burma Peace Process, burmese army, burmese government, Gender Based Violence, human rights abuses, karen women, SGBV, Violence Against Women and Safe Houses, Women in Conflict by Karen Women Organisation. Bookmark the permalink.